Are literary agents the key to a successful writing career? | m a miller – author of young adult s.f. Hi. My name is Tahlia Newland. 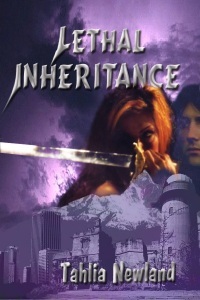 I’m the author of Lethal Inheritance, a YA paranormal fantasy novel. m.a. invited me over to talk about how I went about getting my agent and whether I think they’re worthwhile. There are many authors out there without agents, some couldn’t get one, some never tried, some get on just fine without them, some don’t. So why did I think I needed an agent? Literary agents have access to publishers that don’t accept unsolicited manuscripts. That keeps you out of the slush pile and increases your chances of finding a publisher. They also know which publishers are most likely to be interested in your project and good agents have personal contacts in some publishing houses. These publishers will look at your work more closely because they trust your agent’s evaluation – if you get a good one, if not, that’s another story. Getting an agent is also a stamp of approval. An industry professional believes your work is of a publishable standard and that it’s saleable. That might not matter to some, but it gave me a lot of confidence. A good agent will answer your questions, advise you, guide your career and generally support you. My agent, Debbie Golvan of Golvan Arts Management, recently suggested that I review my ms again before we submitted it to a second round of publishers. Something I wouldn’t have done without her suggestion. The results prove that it was good advice. Once the agent finds a publisher, they will check your contract, explain it to you and where changes need to be made, they’ll negotiate on your behalf. They will also support you in any problems that might occur during the publishing process. A good agent can save you a lot of worry and hassle. Querying an agent is basically the same as querying a publisher. First, get a list of agents. I joined The Australian Writer’s Marketplace to get access to their listings. Next go through the list carefully to find out which ones represent the kind of work you do. Go to their website, look at their submission guidelines and send exactly that. Then you wait. Mostly it’s the first round of rejections, but someone might ask for the full ms. You send it. They read it. You wait – again. There’s a lot of that in this business. If they like what they see, they may offer to represent you. Debbie sent me to her website so I was clear what her role was but she didn’t ask me to sign a contract. That was fine by me. However, I believe that a lot of agents do ask you to sign a contract. Your agent may also ask you to make changes to the ms. Debbie asked me to drop 19000 words. Golvan Arts will receive my royalties, take 15%, then send the rest to me. As far as I’m concerned, Debbie has already earned that through the support and advice she’s given me. Tahlia Newland is an author, a mask maker and a performer. She has written scripts for theatre in education and a book of short stories for children. As well, she is a casual high school teacher specialising in dance, drama, art and whatever else they throw at her! Tahlia is currently on a quest to publish her first novel Lethal Inheritance, a paranormal fantasy novel. She is sharing her journey on her blog ‘Lethal Inheritance’. This entry was posted in A writer's journey and tagged a writer's journey, an author's journey, Golvan Arts Management, Lethal Inheritance, literary agents, Tahlia Newland, The Australian Writer's Marketplace, writer's agent, writing. Bookmark the permalink.